Preparing delicious French toasts, eggs, pancakes, bacons and sausages at home is always everyone’s delight, especially if you would use the best non stick griddles. What is it? A griddle is an essential home appliance characterized by its broad and flat surface, and it is operated by wood, gas, electricity or coal. It also has a wide range of uses for both commercial and residential applications. Today, there are modern griddles to choose from and I’d like to show you some suggestions in the next section so that you can decide on which non-stick griddle to buy to prevent common problems suffered by both amateur and professional cooks who are using ordinary griddles. Ordinary griddles do not let you cook oil-free. If you won’t use cooking oil on it when cooking, there is high tendency of sticking to the surface. This is the least that we’d want to happen. Is that right? Non-stick griddles can cook a wide range of foods, including tortillas and hams as well as prepare sandwiches. These could be hard and sometimes even impossible with ordinary pans, and that is if you’re looking for the best results. Griddles are also perfect in emulating the searing marks, which you can easily achieved using an outdoor grill. Some of us might not want to deal with the harsh weather outdoors, or in some cases, we may not have an outdoor grill in our possession for barbeques when we want them. Versatility: If you want to get your hands on the best nonstick griddle, this is one of the most important factors to check on. Did you know that this appliance could also be used in other types of food, including eggs, bacons and steaks? That’s why find something to let you do more, such as one with a grill combo or dual plates. Durability: After several uses, some griddles would break, but that won’t be a problem if you’re buying a durable product made of hard-anodized aluminum for example. You must also look for those in which handles are riveted and coating is scratch-resistant. Well-insulated handles: The last thing you want to happen is to burn your fingers for suddenly touching hot handles, and no one would like that to happen. Before buying, you must find a griddle that includes cool touch feature. Ease of cleaning: You must look for cleaning and maintenance features to avoid spending so much time in cleaning your appliance. Check on removable components or dishwasher safe features. Affordability: You don’t need to spend much on a high quality product; in fact, good ones can also be available at very affordable prices. However, do not settle for lesser-known manufacturers just for the sake of some savings. Find reputable brands and narrow your choices by setting a budget that you can afford. 1. Presto 07046 Tilt 'n Drain Big Griddle Cool-Touch Electric Griddle. If you’re looking for high-quality griddles, then this Presto griddle may be what you’re looking for its top features and multiple functions. It is easy to use for many meals; in fact, it can also cook up to 50% more versus common jumbo griddles. It is also non-stick, so you can experience the convenience of cooking and cleaning, especially if you’re a busy mother. Because it is a non-stick griddle, you can also cook healthier meals for your family. The product also comes with the innovative Control Master for heat control, letting you achieve the right cooking temperature without guesswork. Additionally, this model has a very large cooking surface, allowing you to prepare up to 12 slices of French toasts at once and giving you an easier time if you have a busy morning schedule. The product is also durable for its aluminum component, a great heat conductor for faster cooking times versus the Elite Gourmet EGR-2013RG that is made of plastic materials. This is one of the best non stick griddles on the market now, as shown by those customers raving in their reviews. The cookware is perfect for preparing your favorite foods, including bacons, sausages, pancakes and home fries. The cooking process is just made easier with its innovative design and cool functions, letting you cook even roast chicken and bake an apple without any hassles. It is made of cast iron material that gives convenience and a pleasurable cooking experience for everyone. Cast iron is known for its great heat conduction and distribution, preventing burned spots and uneven cooking results versus the aluminum of the Presto 07046. The cast iron material also heats well and retains it, making the product ideal even for searing meats even at very high temperatures. The Lodge skillet also offers easy cleaning – just hand wash, dry and then rub it with oil to bring it back to its original state. Additionally, it gives cooks a pleasurable cooking time for its wide range of uses, including baking, sautéing, braising, grilling and frying. 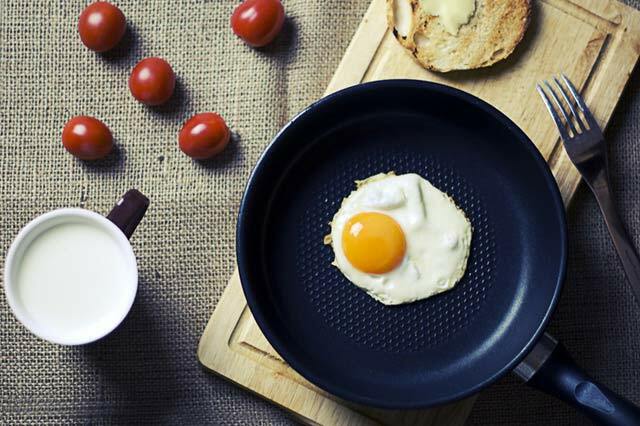 Are you looking for both an aesthetically pleasing and durable non-stick griddle? If so, then we’ve found one of the products that can help you meet that objective. This ECOLUTION model is built to perfection with its innovative design. It is made using heavy-gauge aluminum, which proves more durable versus plastic made griddles out there The item is also ideal for a wide range of cooking purposes, including making pancakes, grilling cheese, sizzling bacons and so many more! You won’t need any ordinary skillets that do not last long if you have this non-stick griddle in your kitchen. For added ease, it also comes with a silicone handle with extreme ability to stay cool to the touch. This time around, you don’t have to worry about burning your fingers when cooking. And for ensured and even heating, the product comes with grooved rings. For non-stick pleasure, Evolve is made with the most advanced non-toxic material Hydrolon that ensures superior non-stick, letting you prepare oil-free food for your family. Another important thing about it is it is PFOA-free, just like other cookware from the brand, guaranteeing its safety – both for the environment and your family. Hamilton is a reputable brand supplying the best kitchen products globally for many years. One of their trendiest offerings is the Hamilton Beach 38519, a reversible griddle, which offers both commercial and residential customers convenience and ease of cooking, no matter it is searing, toasting breads, grilling cheese and so many more. The product is made with the innovative DURATHON ceramic nonstick coating, which is proven and tested to last up to four times versus traditional non-stick products on the market, meaning it won’t peel or crack no matter the pressure it receives. Now if you’re always into preparing big batches of food, then you can depend on it for its 200 square inches of cooking surface that is far larger than conventional and older models. Plus, you can set it up wherever you want with its reversible design, which lets you plug it from either side. The product may also be better when it comes to heat retention for its ceramic material versus the aluminum of Presto 07061. You can also prepare a whole meal at once with its large cooking surface of 200 square inches. For cleaning convenience, all you need is to lift it off and start cleaning. Speaking of maintenance, this product is useful for its drip tray that catches drips and grease, keeping your kitchen clean. The Cuisinart GR-4N is by far the best non-stick griddle for the money we’ve found in the maket. What makes it unique is it is a 5-in-1 device that works in so many cool ways, including as a half griddle/grill, full grill/griddle Panini press and a contact grill by simply turning the selector knob. Having it around is like having five different products in one! You can use it in preparing virtually all types of foods, including bacons, cheese, eggs, French toasts, chicken and so on. And because it is non-stick, you can also keep up with your diet as you can prepare oil-free food on it without any worries. The product also comes with a floating cover to accommodate food according to its thickness. The cooking plates are also reversible and removable versus the WM-SW2N Sandwich Grill that has a fixed cooking plate. It simply translates to better cooking experience for you all the time. With removable/reversible plates, you can clean it easier as well, not to mention the model also has a drip tray that catches mess – drippings and grease. The product also comes with adjustable temperature controls, letting you eliminate the guesswork in cooking as you can automatically set your desired temperature with just one turn of the dial. Upon going through all the best non stick griddles, we can safely say that one that shines above the rest is the Cuisinart GR-4N for its multiple functions and innovative features, which prove to be the most significant when investing on a new griddle that will last long and keep up with the heavy demands. As you know, it is important to select a product that will last for many years and prevent us from spending on repair very often. When buying, you must also check on the convenience of use, including reversible and removable cooking plates that we also found on the product.